В этот раз не буду писать каких-то специальных аннотаций к релизу, просто поблагодарю ildarrr'а за эту пластинку! 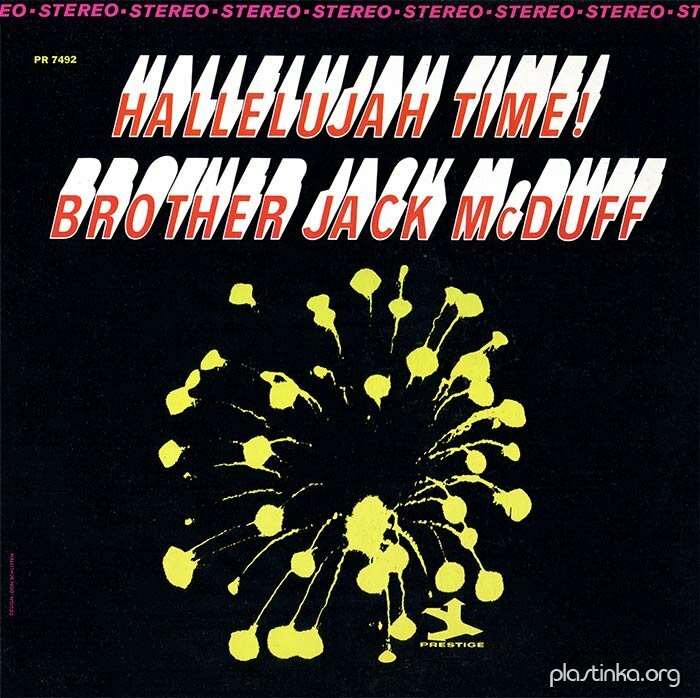 There is always cause to shout at the release of another Brother Jack McDuff album. Now it's time for Hallelujah Time and the joy is written all over the cover, label, and most positively interwoven with .a the music itself. It is interesting to recall the derivation of the world “hallelujah,” for it has Hebrew roots and is a command to praise (hallelu) Jehovah (yah), and even in our secular society it has not lost its sense of being a hymn or song of praise. 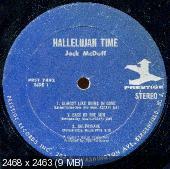 I am sure that it was in this context that the celebrated pianist Oscar Peterson wrote the theme which gives a title to this album, and that emotion is certainly compounded by the intentions of Jack McDuff and his fellows as they add their own rhythmic inclinations to make the entire album explode with that dynamic feeling. In other words, here's a set that has the heat, heart and humor to grab the listener's ear lobes and gyrate him through an emotional experience that must be memorable.
. . . memorable in many ways: certainly the players are soloists you won't be able to forget. 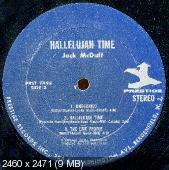 For here Jack McDuff has surrounded himself with an entourage of sympathetic so(u)loists who fit into the enthusiastic atmosphere much like a choir at a revival meeting. You'll be hearing Red Holloway on tenor saxophone, a player with a freshness that grows out of the fertile heritage of swingers such as Gene Ammons and James Moody; Harold Ousley, who has been to similar schools and who swings in similar strains that never seemed strained; George Benson and Pat Martino, two guitarists who both know the vitality of understatement and the authority that comes to every player when he really knows his horn; Joe Dukes on drums, whose unobtrusiveness is felt not heard, and whose solos are consistent and insistent to the over-all control that dominates the kinship of this kindling group. And best of all, there's Jack McDuff, whose sentient and swinging presence is heard underneath every soloist, interwoven in every ensemble, and subtly infectious when he emerges from the group of his own improvisation. In paraphrasing Shakespeare, lay it on McDuff!
. . . and they do lay it on: listen to Almost Like Being In Love and delight in the group’s amour and rapport as they set off at a blistering pace, yet with the understatement and subtlety mentioned above. At such a tempo on Almost it seems almost impossible for a player to develop his ideas—almost. But listen to Pat Martino whose ideas turn Almost into a positive statement of cause and effect that make the listener pause and reflect on how deft many contemporary musicians are in contrast to their predecessors. Jack, himself, fairly dances over the footpedals—with the fleet authority of a good boxer or dancer who has total command of the situation. Or travel through the grooves that lead East Of The Sun, through an unusual key signature and with a distinctive approach. Here guitarist George Benson, who has graduated to become leader of his own group, displays his incisive single note attack. The leader's solo can best be described as easy and loping, moving in long, swinging strides. Au Privave is a blues by Charlie Parker, taken here at a more brisk tempo than on the famous performance by Bird and Miles Davis. Yet, the contrast in tempo does not alter or overly heat the basic feeling of the tune, and Red Holloway’s initial solo particularly involves the intervals of the chords and the melody line in the classic Parker manner. George Benson, on the contrary, finds something of a country and western continuity in his paraphrase of the line, especially in the way that he holds notes at the end of a phrase. The leader's attack is quite consistent with the sophisticated blues approach of Parker, and in that context I am reminded that Charlie Parker may never have recorded commercially with an organist-one of the few possibilities of group ensemble he seems to have missed. (I do have some Bird performances with the Milt Bucknertriofrom air-checks in the early 1950's, though.) I am sure that Parker would have been at home in these surroundings. Charlie Shavers’ Undecided is from a live session, and it is the real “smoker” in the album. Here every listener has eight minutes to digest a super-king-sized morsel of major moments in an alternating interplay of major and minor keys. From the moment that Jack sets his foot on the pedal he sets the rhythm tapping; and Red Holloway captures that incendiary spark from the leader and adds his own smoke signals that must communicate to everyone but mummies. George Benson, too, fans the flame with his best solo of the date. For that matter, I find this sprightly exercise, with its intricate variations on the theme and with the gentle propulsion of Joe Dukes, to be the most tasty track in the entire album. It certainly shows that there was nothing indecisive about the players’ intention on Undecided. Yet, we can’t underestimate Hallelujah Time, Oscar Peterson's Bach-ish blues that shows the intimacy of the group in the most ambivalent manner: in the tightness of their ensemble sound and the looseness of their solo enterprise. Here is a musical translation of the Frenchman’s joie de vivre, that zestful enjoyment of scene and circumstance that allows four musicians to play (joy!) as one. You can hear that these players really live, and if you need further assurance there is the final track of The Live People to solidify and clarify my case. These live ones live with an extra added attraction, tenor saxophonist Harold Ousley, and the two-tenor front line allows for some well developed interplay between horns, guitar, and organ. This is Jack McDuff's own study of what makes people tick—and kick. And in a Latin atmosphere the solos are booting all the way. Dig the tenors' exchange, but don't be short-changed by overlooking Pat Martino's sequence, and the leader's concluding remarks define swing better than a thousand essays. Indeed, there's much to be happy about in Hallelujah Time: heat, heart, humor, happiness. When jazz loses these assets it's nothing but a liability to my ears; but there's no reason to fret, for we're all rich when players such as Jack McDuff are ready to share their talent with us. Hallelujah! Спасибо, Николай! Альбомы старые, - но все же слушать приятно. Найти минтовый альбом тех лет - проблема. Минтовые (запечатанные) из этой коробки были только ремастеры - Joe Dukes Soulful Drums и Red Holloway - Cooking Together, недавно выложенный. Да и те я уже успел раза по 3 послушать) Но вот пластинки органиста Лонни Смита 1965 и 1975 годо в следующий раз притащу новые. ildarrrr, да, представляю, что значит найти минтовый альбом 60-х годов, это практически невозможно. Я вот Джо Дассена никак не могу собрать все альбомы в хорошем состоянии, а это 70-е и большие тиражи, а все равно очень мало винилов попадается в хорошем состоянии.